Today we saw a bus going Maximum Touge Attack on a snowy Kansas City street, taking out a street light. It made us wonder if anything bigger has ever gone sideways. Reader CJ_S4 answered our idle musings almost immediately, with a story of skidding a full-size Caterpillar mining dump truck. He posted it with a picture of a 797B model, which weighs roughly 1.375 million pounds and has 3,370 horsepower at the flywheel. 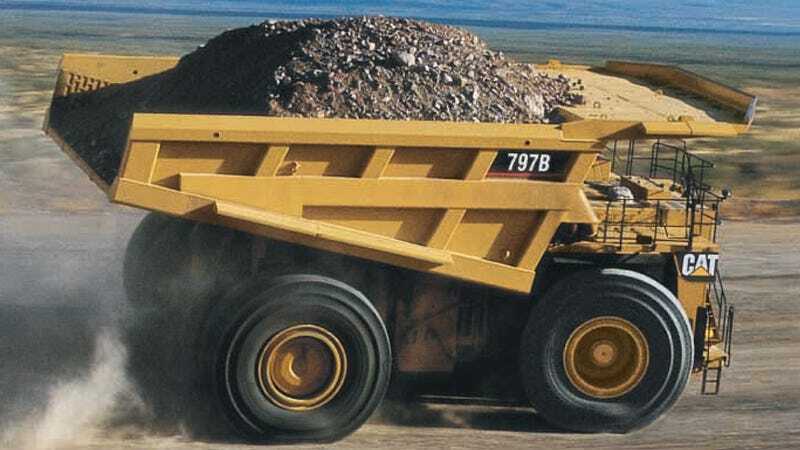 I worked an internship at a mine in southern Colorado one year and was allowed to drive (with supervision) one of the large dump trucks that brings material out of the pit. I was instructed to pretty much treat the accelerator as a on/off switch. When I got to the top I was told to drive to the opposite side of the yard, but not before a giant water truck turned the surface into silty mud. Naturally, I floored the accelerator while turning and all 4 of those 10' tall rear wheels broke loose - DUMP TRUCK DRIFT!!! If this story is true, it might just be the biggest vehicle to ever get some opposite lock. Have you seen anything bigger/heavier go slideways?